We are the leading distributors of high grade Aircast Devices. These devices are the brand of DJO Inc. and are widely used in medical industry. They highly appreciated for their best performance and optimum results. Being the market leader, we present Aircast Airselect Short Walker Boot to our esteemed clients. This product is used by the people who are suffering from injuriesand also by the people who cannot use standard height walker due to their limb length and calf circumference. Additionally, it provide wide foot base that is useful for dressing and it is also presented with a semi rigid shell and adjustable aircell that offer protection. Aircast Walker has low rocker that provides comfort to the patient. Applies intermittent pulsating compression to the tendon and fascia to help minimize swelling and promote circulation. Our organization is offering Airlift PTTD Brace of fine quality. It treats posterior tibialis tendon dysfunction and stabilizes the condition. 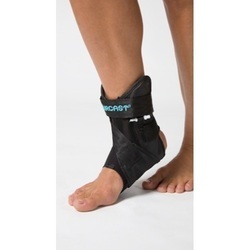 This product is available with simple two strap application and is designed to provide stability to the ankle. Also, this product is available for small, medium and large size for left and right foot. Adjustable arch aircell for individualized support and comfort. Anatomically designed shells for secure ankle stability. Rear entry design and simple two strap application promote ease of use and compliance. Posterior tibialis tendon dysfunction or adult acquired flat foot. Available in Small, Medium & Large sizes for Right & left. We are offering high grade Aircast XP Walker with Diabetic System to our esteemed clients. It is used to protect foot, Charcot foot, Neuropathic ulcers and from fractures. This equipment includes stockings, hand bulb, insoles, and XP diabetic walker. In addition to this, it is being offered at the best rates in the industry. Insoles (one Impax™ Grid and one Plastizote). Hand Bulb with Pressure Gauge. An aircell lined shell that maximizes plantar unloading, regulates shear stress, and provides protection and immobilization. Graduated compression to help reduce edema. Multi-aircell support for a "total contact" fit. Regulated aircell inflation with the specialized Hand Bulb with Pressure Gauge. A specifically designed rocker to reduce plantar pressures and improve off-loading. Stable fracture of foot and/or ankle. Size Available in Small, Medium & Large sizes for right & left. 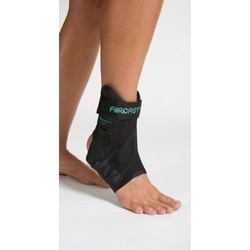 Being the leaders in the industry, we offer high grade AirSport Ankle Braceto our clients. This product is used in chronic instability and ankle inflammation. These ankle braces are filled with foam and provides support to the injured ankles. It is also provided with ATF cross strap to keep the ankle stable and it is known for its long lasting durability. Also, AirSport Ankle Brace are being offered in small, medium and large sizes for left and right foot. Our clients can avail from us a matchless range of Aircast Pneumatic Armband. This band is used to minimize the pain in the elbow and is highly appreciated by the clients for its superior performance and durability. Its design is simple, easy to apply and is available in universalsize that suits the people of all age group. Also, it is presented at the industry leading rates. Focused compression for less constriction. Breathable material enhances comfort and wear-ability. Simple, effective design makes it easy to apply. One size fits most for reduced inventory requirements. Our team is engaged in offering Infrapatellar Band to the clients. It is used to give relief to the patients from Osgood schlatter and patella tendonitis. This band is available with foam padding that provides extra relief to the patients. In addition to this, it is available in universal size that can be avail from us at the best rates in the industry. Focused pressure on the patellar tendon provides superior relief. Foam padding for added comfort. Available in Universal size only.